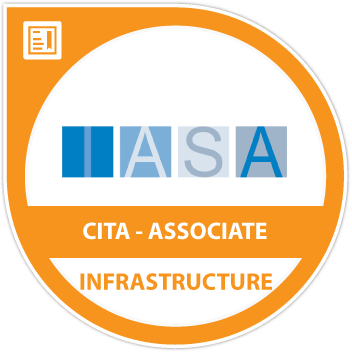 Earners of the IASA Certified Information Technology Architect (CITA) -Associate (CITA-A) badge have demonstrated a practical application of the ITABoK in one of the Specialist Areas (Business, Information, Infrastructure, Software, Solution) with a minimum of 3-5 years of architecture experience. They have demonstrated an ability to utilize the knowledge acquired from both the Associate course and the Business Technology Strategy foundation material to find solutions to posed scenarios. Complete the Infrastructure Architect Associate course (online modules with mentoring or onsite instructor-led course). Pass the CITA-Associate level exam.